Before I talk about this book, I have to talk about another Photoshop digital painting book that 3dtotal Publishing published in 2012 called Beginner's Guide to Digital Painting in Photoshop. That book covered many aspects of digital painting. The information included were sort of more contained and related to a specific topic or painting a specific subject matter. So the tutorials were shorter but still covered the essentials well. In this new 288-page paperback on Photoshop digital painting, there are only five chapters. First two chapters talk about digital painting basics, Photoshop interface, settings and tools. It's a comprehensive introduction to the basics written for beginners who have absolutely no knowledge of digital painting or the Photoshop software. These two chapters will help you understand the potential of digital painting. These two chapters were written by Markus Lovadina, an assistant art director in the entertainment industry. The next three chapters are lengthy step-by-step guided tutorial projects. Each chapter or tutorial is 50-70 pages! They are as comprehensive as they can get. The first tutorial by James Wolf Strehle is on painting a fantasy landscape. Here you'll learn how to paint something from scratch. The next tutorial by Matt Tkocz on alien crash site focuses on using photos and other assets in your digital painting, on how to collage them together and make the look and feel right. The last tutorial by Daria Rashev is on painting a character in scene. This is one of those copy and follow along book. The only downloadable files available are brush sets and some settings files. So basically, you just copy what you see, learn and paint. Throughout the tutorials, you'll be able to learn all the tools necessary to make such paintings, and get hands on practice with them. This is a tremendous and almost essential resource for those who want to learn digital painting in Photoshop. It's packed with tips, techniques and insight. It's also a good complement for the other digital painting book that I mentioned earlier. 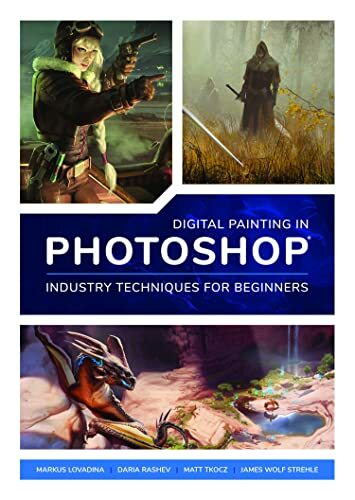 These two books will give you a really good start with digital painting.